Hanger steak is a cut of beef from the lower belly of a cow. Hanger steak is still on the rise to kitchen popularity. In the past, butchers generally reserved this flavorful cut for their own kitchens- many home cooks weren't familiar with cooking hanger and considered it an inexpensive, inferior cut of meat. Hanger steak is best cooked quickly over high heat and served thinly sliced. It's a popular cut in Mexican cuisine, especially in fajitas. It's named "hanger" because it hangs off the cow's diaphragm. 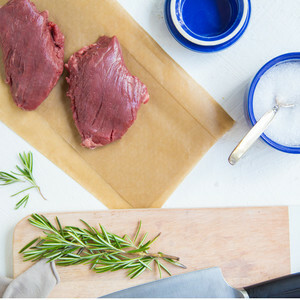 They can be tricky to trim straight off the steer because of strong connective tissues and silverskin, but once you get the hang of it (or ask your butcher nicely) the resulting cut of meat is tender and quick-cooking. Prepared hanger steaks are long and narrow and generally about an inch thick; each cow yields two portions. These steaks are quite lean and are a good source of protein and iron. Hanger steak has a grain unique from other popular cuts. The muscle appears to be fairly loosely connected, meaning it marinates well and quickly. It is also grainier than other steaks, so it should never be cooked above a "medium" temperature (the interior should still be pink). Ideally, hanger steak is always served medium rare. Hanger steak is often grouped with flank, flat iron, and skirt steaks- though it is not the same, all these cuts share similar properties- and often similar price points.